Over the last 20 years, the music improvisation duo of Kattt Atchley and Ron Heglin have gradually developed a vocal sound that integrates language and vocal sung traditions. With a focus on experimentation, they have shaped a signature sound from imagined landscapes, melodies, multiple tunings, and amplification. 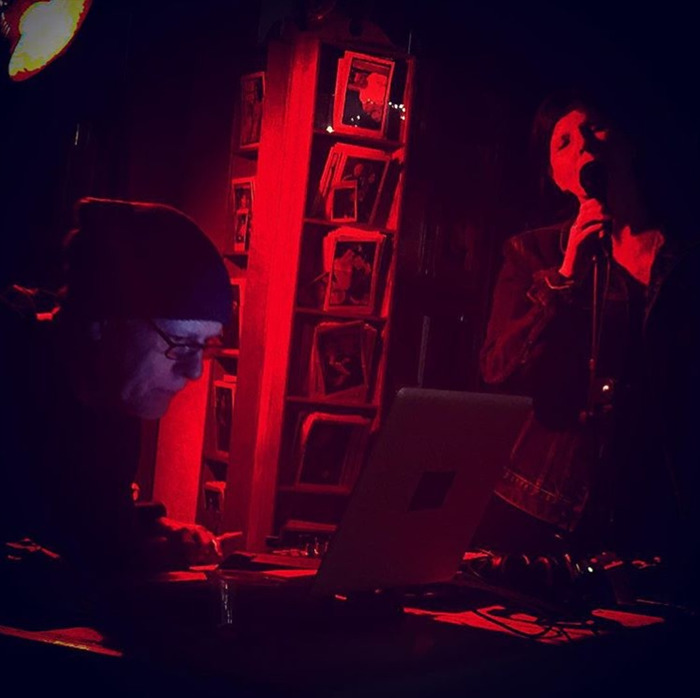 Kattt and Ron plan to release their first duo recording (recorded and mixed by Phillip Perkins) sometime early 2019.Kattt Atchley is an experimental musical vocalist, composer, and improvisor who creates a blended sound using her voice, pitches (multiple tunings), amplification, and imagination. Since the mid 90’s, she has performed solo and with others at various venues, from theaters to radio stations to galleries to museums to back yards. She has longtime collaborations with Ron Heglin and, with her husband, K. Atchley. Kattt studies voice and Hindustani classical music theory and is a member of the Vasundhara Choir directed by her teacher, Rita Sahai. Ron Heglin is a Vocalist and Trombonist exploring the broad sound palette of the human voice as expressed in many languages and musical traditions. This has led to the evolution of an imaginal or fictional language which is presented spoken and/or sung in performance either solo or in ensemble. Mr. Heglin has been a student of North Indian Vocal Music and credits this study with providing a musical grounding to his present work. As a Trombonist and as a Vocalist he has a long history of performance both locally and internationally as a part of the improvisation and new music community. Kenneth Atchley is an artist of abstract electronic sound: noise and tone poems, drones, generative ambient works. He lives in the East Bay. Atchley's performances and works have been featured in international venues including STEIM (Amsterdam), Skolska28 (Prague), N.K. (Berlin), The Kitchen (NYC), T-U-B-E (Munich), CEAIT/Red Cat (Los Angeles), Gallery of Fine Arts (Ostrava), Bang On A Can (NYC), The Loft (Cologne), Stork Club (Oakland), Gray Area (SF). Atchley's sound works have been released online including: "Vexing Shadows" (CDBaby, Spotify, Amazon), a variety of works on soundcloud, and CD: "Fountains" (Auscultare Research), and the duet with John Bischoff "Sealed Cantus" (Bischoff's 23Five CD "Aperture").